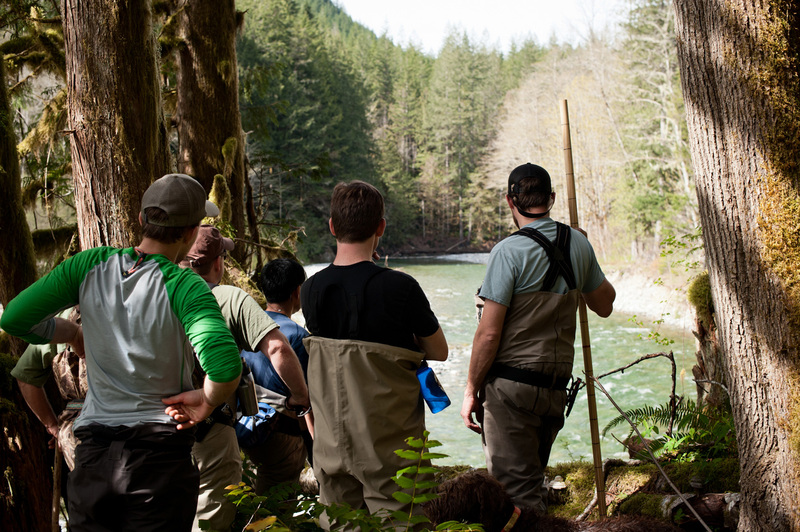 ABOVE A group of volunteers from the North Sound Trout Unlimited Chapter (NSTU) based in Bellingham, WA, search a crystal clear tributary for signs of life. We’re from all over the Northwest and our life histories are just as diverse as the fish we love to chase. Dave tells stories from Kamchatka while others find parking spots along the highway. Toshi unwraps his Subway brunch. River dances around the parking lot annoying the dog like 8-year olds do. A group of college kids are planning to brave the cold waters without waders. We are all still learning and here to do even more. 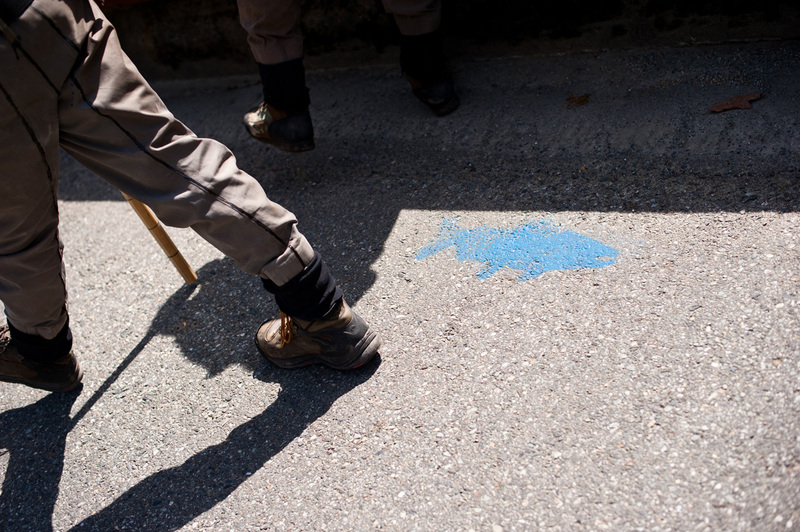 above Pinstripe wader-clad volunteers walk past a fish marked section of Highway 20. Not enough is known about adult wild steelhead numbers in many western Washington state watersheds. That gives Wild Steelheaders United, with its advocacy and conservation goals targeted at improving wild steelhead populations throughout their native range, plenty of fodder for angler science programs. The goal is to get passionate fishers involved in the gathering of scientific data about the places they love and the fish that inhabit them. With the help of local Trout Unlimited chapters these programs are generating a renewed interest in grassroots, hands-on monitoring and data collection, which translates to more advocates for wild steelhead. Many spring fisheries in Washington are closed to protect spawning populations of threatened steelhead and tromping around outdoors on sunny spring days searching for signs of life is the next best thing. ABOVE Viewing a creek from above, Nick Chambers (right) of Wild Steelheaders United leads an instructional spawning survey on a small tributary in the North Cascade mountains of Washington state. 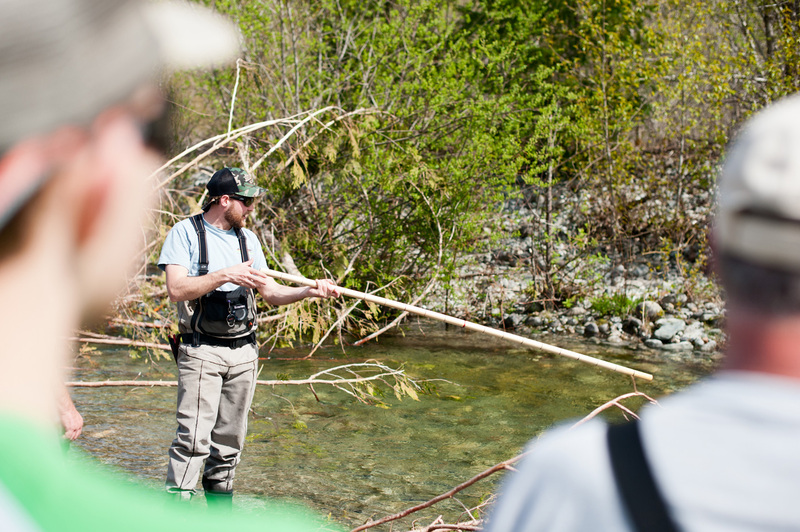 We’ve gathered along Washington’s State Route 20 to learn from Nick Chambers and Bill McMillan about steelhead spawning surveys, which involve poking around in the smaller tributaries of rivers like the Skagit to note any spawning activity on a regular basis. Bill’s calm nature and chirpy voice are barely audible above the rush of gravity pushing on water and no one is surprised that he has devoted so much of his life to studying these fish. Still, the fire in his voice is evident. Bill lives on the banks of one of the most famous steelhead rivers in the state and has written the book on steelhead fishing, a lifelong conservationist with a keen understanding of the trouble these fish are facing. 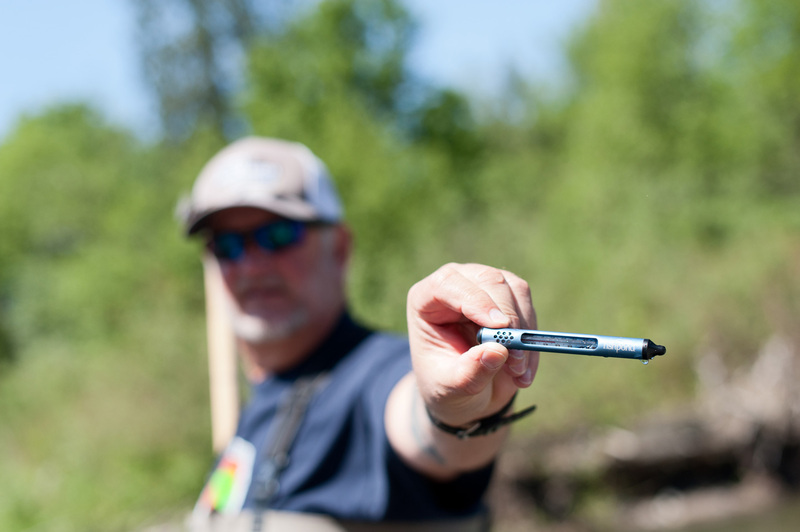 ABOVE Nick Chambers uses his dowel to point out a possible steelhead redd, and discusses the finer points of identification and the recording of valuable data. Nick Chambers is the sort of guy that your parents might wish you were. Quiet, confident, handsome and dangerously smart. Nick has long been obsessed with steelhead, as well. It happened naturally, growing up along Oregon’s Rogue River and the healthy wild fish populations the river nurtures. His fisheries-based higher education and summer guiding gigs in Alaska kept Nick in his waders and close to the fish. While working at a fly shop near Corvallis, OR, he realized the conservation benefit that was present in the Bluebacks Chapter of Trout Unlimited and this was largely the beginning of the angler science programs that are growing in the Northwest. Through stream surveys chapter members found hatchery steelhead in what was believed to be a completely wild summer steelhead population in the Siletz River watershed. Working with the Oregon Department of Fish and Wildlife, an existing fish trap was modified to limit the number of hatchery origin fish able to pass and help keep wild fish wilder. ABOVE Paul Dudley records a stream thermometer reading, part of the data NSTU volunteers are collecting during steelhead spawning surveys in the North Cascades. Further south, in the Willamette Valley, TU’s Redside Chapter and Coos Bay Coastal Cutthroat Chapter are surveying parts of the Smith River. There, chapter volunteers will be Passive Integrated Transponder (PIT) tagging steelhead smolts alongside the Bureau of Land Management, US Forest Service and Oregon Department of Fish and Wildlife. A recent relocation to Washington state led Nick to take on an active role with Wild Steelheaders United and propagate the angler science programs. Working closely with local Trout Unlimited chapters in Oregon and finding success, he’s brought a similar model of angler science to some Washington chapters utilizing volunteers who know them best. 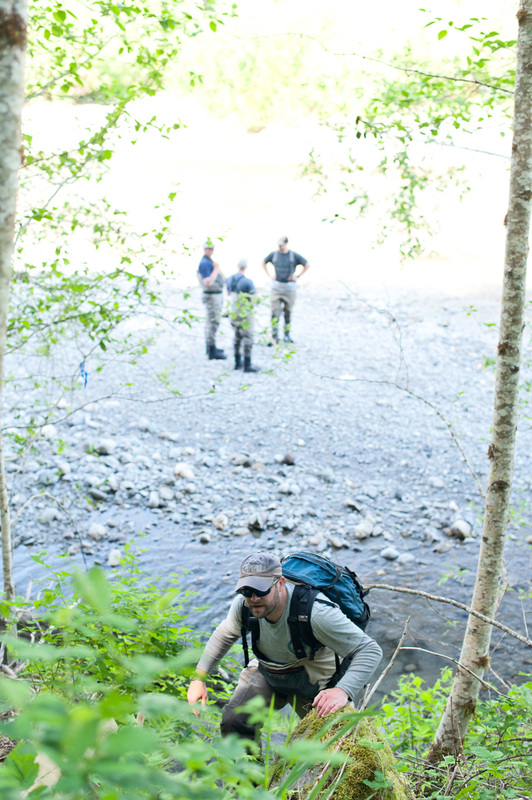 ABOVE TOP TO BOTTOM Scott Willison ascends a creek bank after an afternoon spawning survey. 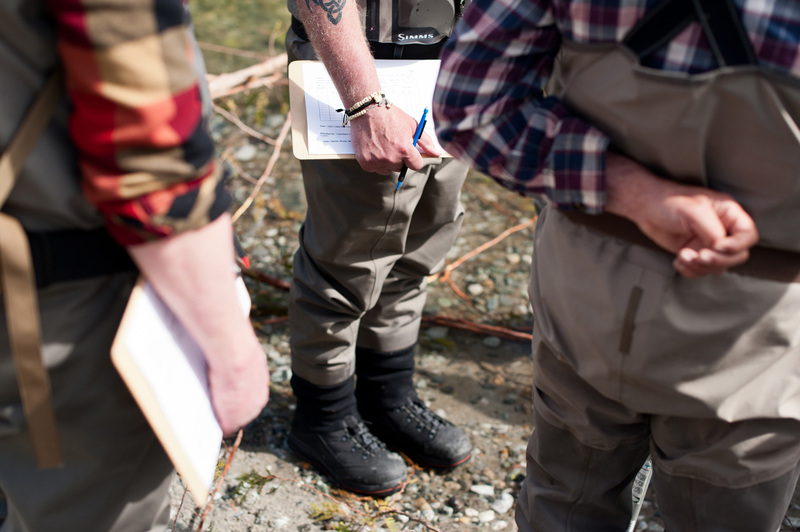 NSTU chapter members, clipboards in hand, listen as instructions are given on data collection for spawning surveys. Bushwhacking along a half-mile stretch of creek, the water is clear and it is beautiful. We’re learning to document findings like water temperature, substrate measurements and other subtle observations as if keeping a fishing log. 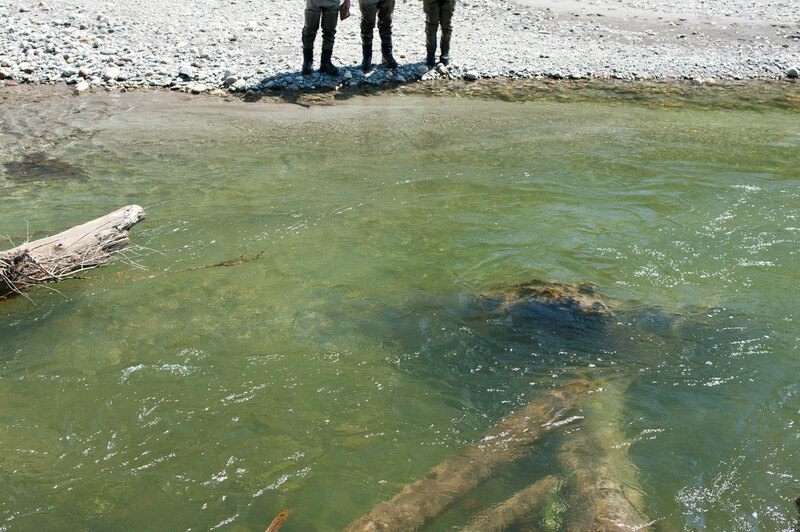 If we’re able to collect the requisite data in a precise and regular manner on stream reaches that the Washington Department of Fish and Wildlife doesn’t currently survey, there’s a good chance that eventually they’ll have to take note of it and use all available data to help inform their management practices. 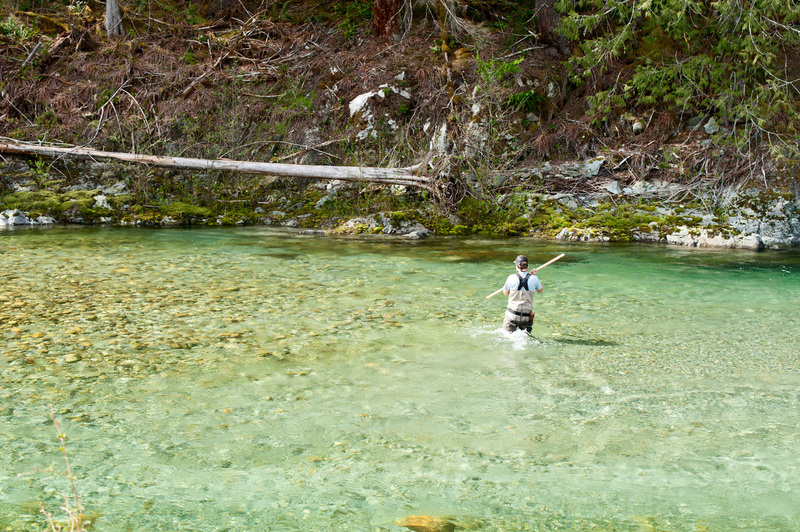 ABOVE Nick Chambers gives the far bank a thorough look for signs of steelhead spawning activity. Our collective eyes focus on tailouts where water organizes rock by size; we double and triple take into shady, protected cutbanks and in dark emerald-green buckets looking for shapes that might be fish. Instead of a fly rod, Nick carries a two-meter dowel, more representative of a Bo staff than a science tool, more ninja turtle than fisherman or biologist. The dowels are marked in half-meter increments and are used to measure the length and width of redds. Today we don’t find any redds. Or fish. Maybe they are further upstream or have found really good hiding spots from the bright sun. Maybe we are too early. With regular chapter outings the data will be collected and the fish will be found—or signs of them will. We are still learning and it’s important because these fish need our help. To learn more about the Trout Unlimited angler science programs, please visit https://www.tu.org/science/science-engagement/angler-science/ or ask your local chapter how you can become involved. ABOVE There is a fish in there somewhere. NSTU chapter members stare into the depths of a small spawning tributary searching for fishy shapes and movement.